It’s snowing where we are. No one’s on the road and schools have been closed. Time to stay cozy inside and enjoy the white world through the window. And make some soup! The simplest soups are the best, and this is a cheap meal to boot. My friend calls this pizza soup because it is served with a drizzle of extra virgin olive oil, a few fresh basil leaves and fresh grated parmesan. By all means leave the cheese off if you are vegan! 1) Heat up the olive oil and cook the onion on a low heat (and garlic if using). About 15 minutes for the onion to soften and cook thoroughly. 2) Add the tomato paste and the barley and mix. Then add the vegetable stock cubes, water and tomatoes. If using fresh tomatoes, you may want to peel and deseed them. I don’t bother with that and I think the soup turns out fine. Canned tomatoes work great when tomatoes are not in season. 3) Add the cooked lentils, any leftover parmesan rind, a tsp of dried basil or a few leaves of torn fresh basil. Add fresh ground pepper to taste. 4) Bring to a boil and then turn down to simmer gently on a low heat for 15 minutes. Taste and adjust seasoning. Also add extra water as the barley can absorb a lot of water. 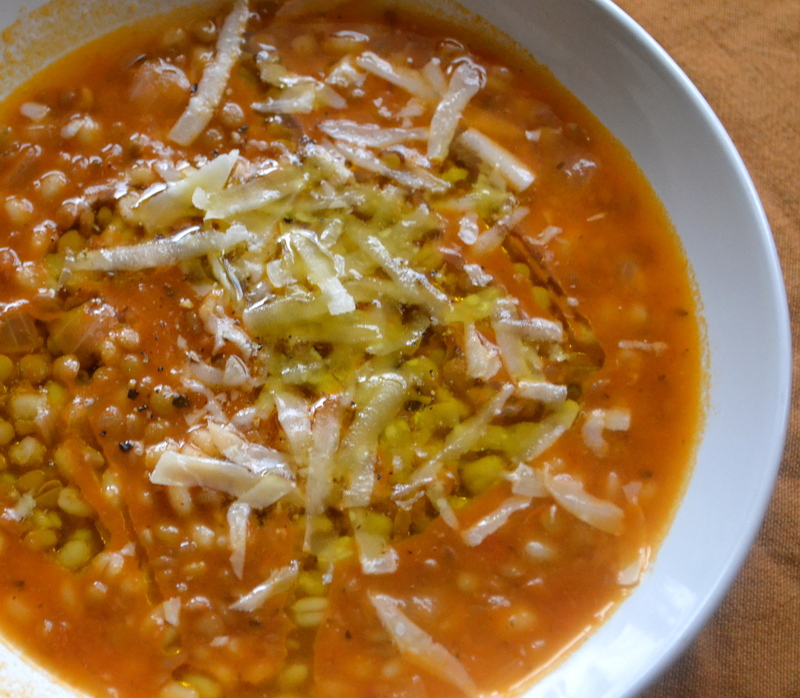 This should be a gently flavored soup, really brought to life by the texture of the chewy barley and the flavor from fresh basil, olive oil and cheese at the end. 5) Serve in individual bowls with a couple leaves of fresh basil, fresh grated parmesan and a drizzle of good olive oil and fresh ground pepper.